News and views for Sage CRM Business Partners. The Release date for Sage CRM 2019 R1 is today Monday, 4th February 2019 – that is when the software has been released as ‘GA’ to each of the Sage regions and countries. This doesn’t mean that it will then be globally available for all customers – the local release of the software is down to each local Sage teams and scheduling around the release of the different accounting integrations. Please contact your local Sage support team to gain access to the software. 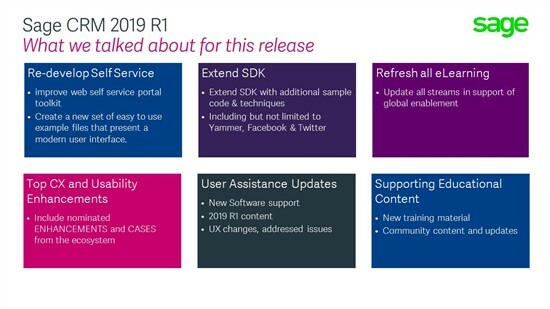 Sage 2019 R1 has focussed on incremental improvements and enhancements of existing features. The developers have continued to grind down on the bugs and the Release Notes document over 40 issues addressed in this release. All these changes have been documented in the Help Center, which has now been updated to include 2019 R1. Where can the new release be downloaded? All I see in the Releases & Patches in downloads here is 2018 R3? I believe UKI partners should have been send a email on the 20th February announcing the product release with the download location. Can you check your inbox for emails from SageServices@custcommunications.sage.com? Just checked my inbox and email logs on our mailserver and can't find any communications re CRM from that address. I can see other communications re Sage200 but nothing re CRM. Will the new version not be available in the Releases and Patches section as normal? I will ask my colleagues to post there. But the install should be on the partner portal.